Antique Nomadic Rugs – To most people the concept of the rug, especially the pile rug, is virtually synonymous with the Orient, above all Persia and Turkey. Flat woven floor coverings in plain weave or tapestry technique are to all intents ubiquitous. They were developed all over the world, in various materials, from the earliest times by all peoples who possessed the skill of weaving. In the case of knotted or pile carpets and rugs, the source is not so generalized. There is no doubt that the Middle East from Persia to Turkey became the main region for knotted carpet production from the Middle Ages onward, but it is very unlikely they were invented and first produced there. Pile carpets are most immediately a decorative textile substitute for furry hides or sheepskins. Like the latter, their function relates to insulation and comfort as well as décor. Such woven versions of hides or hide rugs evolved for various reasons. First, by shearing the animals and weaving the rugs out of the wool, it was no longer necessary to kill the animals to have a rug. And by weaving the rug it became possible to make it into a piece of decoration as well. One could dye hides in one color, or in several swaths of color, but it was not easy to make anything approaching a design in this way, at least not with any intricacy or permanence. But a woven pile rug, could be given some sort of design, just like flat-woven textiles, while also imitating the texture, density, and protective quality of fur hides. This is how the pile rug came to be born, but the question is where? From the outset it seems improbable that such an adaptation of fur hides took place in the warm climate of the Middle Eastf, except for the mountainous regions of Turkey, the Caucasus, and Persia. But mainstream Oriental rug weaving has always been primarily an urban industry, not a production of remote highlands. 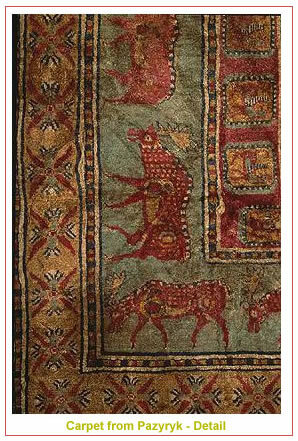 Moreover, the many archaeological discoveries made in the last century tend to indicate that the earliest carpets were produced and invented beyond Central Asia in the High Altai Mountains of Siberia to the north and west of Mongolia. The inhabitants there were tent-dwelling nomads whose material culture was dominated by textile production. Such people required rugs to protect them from the elements, in addition to embellishing their domestic environment. It seems that these peoples created the knotted pile carpet by about 600 B.C., if not earlier. The specific evidence for this comes from the discoveries made by Russian archaeologists at the frozen tombs of Bashadar and Pazyryk in the High Altai region. The site of Bashadar produced a fragment of a pile carpet carbon dated to the sixth century B.C. 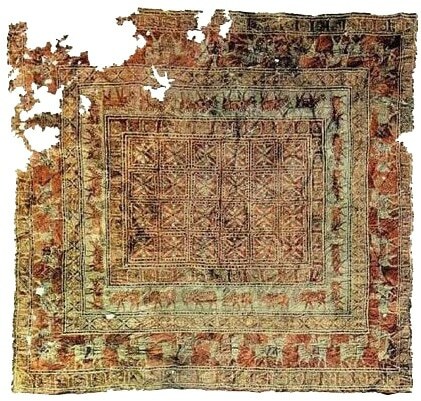 Unfortunately, no pattern is discernible on this fragment, but at Pazyryrk another pile carpet was discovered damaged but virtually intact, datable to the fifth or fourth century B.C. After conservation, its color and design turned out to be nothing less than astounding. The center of the rug had a king of chessboard design with small floral motifs in each square. The borders also had floral designs, as well as a frieze of horsemen, one of griffins, and another of fallow deer. The palette had rich reds, soft greens, blue, and gold, with a velvety pile. Because of its design and technical sophistication, some scholars have doubted that the Pazyryk carpet was a product of antique nomadic rugs. The frieze of horseman and the floral designs are clearly related to ancient Persian art, especially the reliefs at the great site of Persepolis. The weaving technique is also very fine, which, to some scholars at least, suggests urban workmanship or origin. 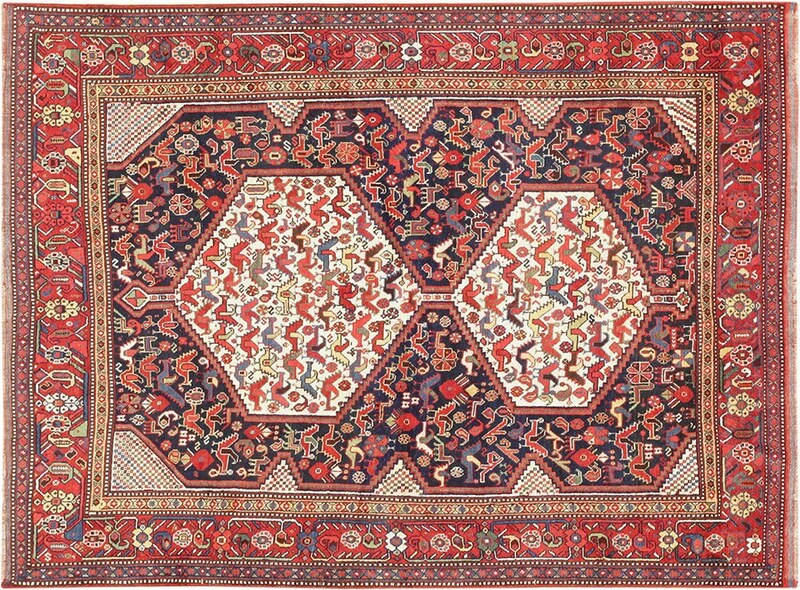 Consequently, the Pazyryk piece has often been touted as the world’s oldest Persian rug. But this is most unlikely. 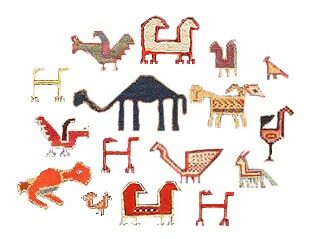 Other frozen tombs at Pazyryk produced fragments of ancient Persian flat woven tapestry textiles with figurative decoration. Since such textiles were imported by the Altai nomads, it is easy to see how designs from Persian court art could have reached them. The desire to imitate such intricate tapestry designs also explains why the weavers utilized a finely knotted technique, in order to reproduce such delicacy and detail. In addition, the frieze of deer is not Persian. 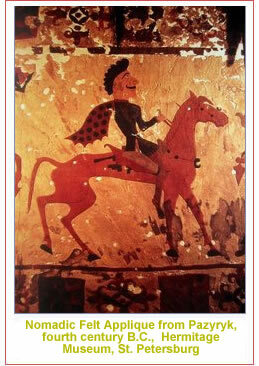 They come from the local repertory of Nomadic “Scythian” art. The evidence of the wool and dyes in the carpet is also decisive. The wool is identical in type to the wool of sheepskin hides found in other tombs at Pazyryk, which were clearly local. The red dye in the carpet is made from lac or kermesic acid, derived from insects, and the particular type of lac is specifically Polish or Baltic in origin. This dye would have been more readily available to the wide-ranging Eurasian nomads who lived from Eastern Europe to the High Altai than to the ancient Persians far to the south. It is therefore most likely that the Pazyryk carpet was woven locally by nomadic peoples, even though its design reflected the cosmopolitan influences of far-off regions. Scholarship has come to recognize, moreover, that nomadic Asiatic weavings – rugs, tapestries, and embroideries – produced at various times and places generally tend to reflect the impact of urban textile production from the Middle East. The Pazyryk carpet is simply an early example of this phenomenon. But even if knotted pile carpets were developed by Central Asian or Altaic nomads, the idea, if not the actual carpets themselves would have reached the Middle East by ancient times where the technique would have been adopted in local production. 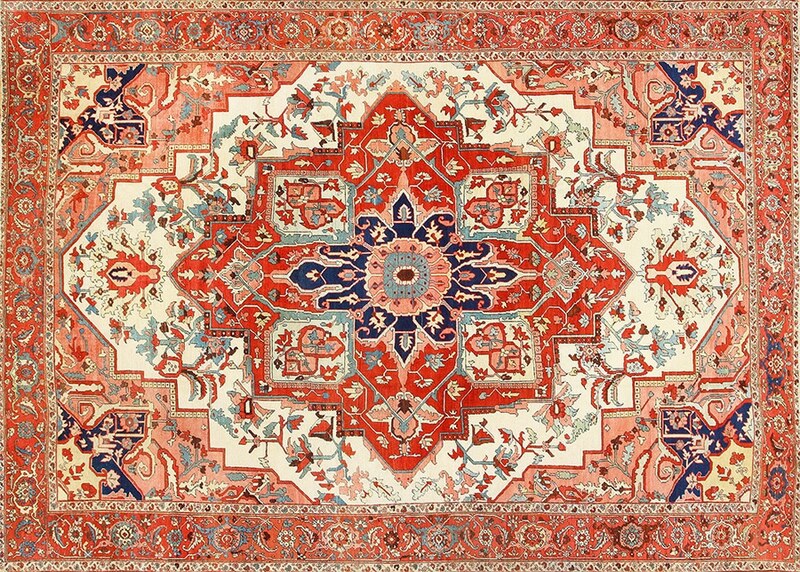 It is very likely that the ancient Persians also made knotted carpets like their nomadic neighbors to the north, but these have not been preserved. Nor do we have actual pile carpets preserved from Greek and Roman culture. Classical textual references to carpets exist, but they are ambiguous; they could simply refer to flatwoven floor coverings or blankets. Not until late antiquity in the burials of fifth-century A.D. Roman Egypt do we again encounter actual pile carpets, made now in a looped technique. Around the same time there is also continued evidence of carpet production from Central Asia and the Caucasus, where pile carpet fragments have been discovered in caves. Fragments of first century A.D. pile rugs discovered on the western periphery of China and Tibet suggest that the nomadic tradition of the knotted carpet spread east and southward from the Altai region as well. Persian Antique Nomadic Rugs – A certain mystery and romance attaches to the concept of the Oriental rug, but perhaps the most romanticized objects of this kind are the so-called nomadic rugs from Persia. What distinguishes antique nomadic rugs of this type is, first of all, the social and economic basis behind them. The nomadic rugs were produced by Persian peoples whose identity was organized around various tribes and clans. Their economy was depended on domesticated livestock, especially sheep and goats. Their style of life was that of a nomadic, tent-dwelling population that periodically had to move in search of grazing for its flocks, as opposed to a sedentary population based on agriculture. In Persia, the most well-known nomadic weavers are above all the Turkmen and Baluch tribes of the Northeast, the Khamseh, Afshar, and Bakhtiari, of the Southwest, and the Shahsavan of the Northwest Persia. In terms of Persian rug design, however, there is no single, unifying feature that one may define as nomadic. This does not include, of course, a taste for abstract geometric forms or highly geometric animal and floral rug motifs, a taste that is also typical of village weaving. The tribal nomadic Persian rug design repertory has often been claimed to be incredibly ancient, involving motifs that stem from the timeless tribal culture of its weavers. 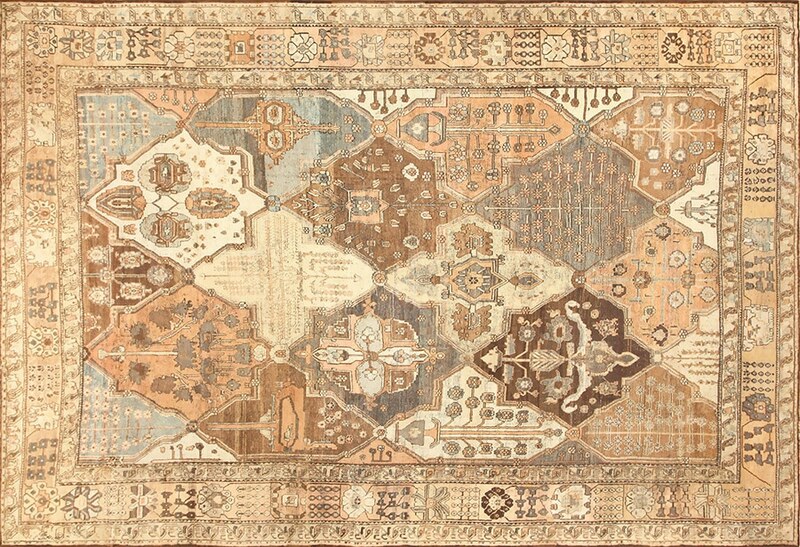 But like those of village weaving, the designs of nomadic rugs originated as highly abstracted versions of city rug designs of floral, animal, or geometric medallion type. They represent the creative artistic side of the normal economic relations existing between nomadic peoples and their sedentary village and urban neighbors. 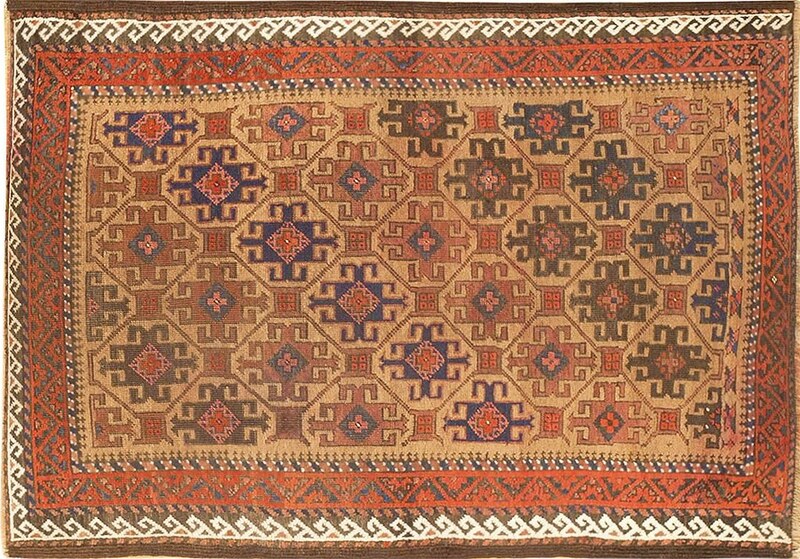 At times nomadic rugs, especially those of Turkmen, also adapted the much finer technique of urban Persian weaving, in contrast to the coarser weave found in most nomadic work. The truly distinctive aspects of nomadic weaving are primarily technical. As the products of tent-dwelling peoples they tend to be woven on horizontal looms set up on the ground rather than on vertical looms set up in houses. And as the products of nomadic sheep-herding peoples, they also tend to be made entirely of wool, including the foundation of the rug. This contrasts notably with city vs. village rug production, which utilizes spun cotton, a sedentary agricultural product, for the rug foundation since cotton enables a more consistent tension allowing for straighter, more perfectly rectangular weaving. The format of antique nomadic rugs is also distinctive. They are not simply floor coverings, or at time cushions, of variable size like urban and village rugs. Instead they are also woven as storage bags, both large and small, hung on the tent walls or used on pack animals, effectively serving as nomadic equivalents of closets, cupboards, and chests or boxes.